Storing genetic diversity as seed is the best researched, most widely used and most convenient method of ex situ conservation. Much is known about the optimum treatment of the seeds of most major crops. Requirements include adequate drying (seed moisture contents as low as 3% for oily seeds and 5% or more for starchy seeds); appropriate storage temperature (-18°C is recommended for long-term storage); and careful production of quality seed to ensure the greatest longevity (storing them in hermetically-sealed containers). It is the principal conservation method for species producing orthodox seeds that withstand desiccation to low moisture content and storage at very low temperatures. Most arable and forage species, and many tree species, produce seeds in this category. Several important tropical and sub-tropical tree species produce seeds that do not survive desiccation and cannot tolerate low temperatures, and which are therefore not easy to store; these are known as recalcitrant seeds. Techniques exist for storing some recalcitrant seeds, but the seeds are usually short-lived and each species requires its own method. A third category of seeds showing intermediate behaviour has also been recognized: these seeds tolerate combinations of desiccation and low temperatures. There is, in fact, a gradient from orthodox to recalcitrant, with no sharp boundaries between categories. Although research has been conducted to overcome problems associated with seed conservation, little progress has been made beyond short-term storage of non-orthodox seeds. The underlying principle of successful seed storage is to maintain genetic integrity of accessions as seeds with high viability for long periods. Seeds of the original sample should be stored under the best possible conditions to ensure safe long-term survival, while seeds of accessions that are frequently requested by breeders or other users should be stored in the active collection. Genebanks may maintain both base and active collections or focus on only one. Such decisions are based on the purpose and needs of the genebank and economics of conservation. For orthodox seeds, low temperatures and low moisture content are used to extend longevity and reduce regeneration intervals with related risks to loss of diversity and genetic integrity. Genebank requirements differ for crops and it is important to select a combination of temperature and seed moisture content specific for the species that will retain high viability for many years of conservation (see specific crop regeneration guidelines). Select a site with a cool, dry environment, if possible, to improve the efficiency of controlling the environment. Select a secure site with the best possible physical safety against theft, and avoid areas with natural threats such as earthquakes, volcanoes and hurricanes. Select a site with reliable electricity supply and adequate rainfall or water supply needed for associated laboratories. Construct the building with shade and North facing to minimize solar heating. In areas with erratic electricity supply, a standby generator is essential to maintain the controlled environment. The commonly available options for seed storage are walk-in cold stores, freezers and liquid nitrogen dewars. The choice depends on the number of accessions to be stored, seed size and storage temperatures selected. Select walk-in stores for large collections or large seeded species where space is needed. Select chest or upright freezers when collections are small and sub-zero temperatures are required. Select liquid nitrogen storage when collections are small and sub-zero temperatures are required for very long-tern storage. Assess the current collection size and probable number of accessions expected over the next ten years to determine the size and type of store needed. Use good insulation of about 200 mm thickness on coldrooms to reduce the electrical running costs. Monitor and log the temperature daily and check levels of liquid nitrogen weekly. An alarm system can be used to alert staff to malfunction of the cooling system and need to top-up liquid nitrogen. The required minimum number of seeds for a genetically homogenous sample is 3000-4000 seeds and for a genetically heterogeneous sample it is 4000-12 000 seeds. More seeds should be stored for those accessions that are frequently requested or have long regeneration periods (some slow growing trees), to reduce regeneration requirements. 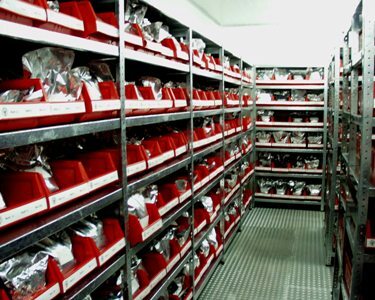 The organization of storage space depends on the type of storage facility and the type of containers used in the genebank. In view of the cost of maintaining cold storage, the space should be optimized so that a maximum number of seed accessions can be stored. For a walk-in cold store, use moveable racks that maximize storage space. Arrange the distance between each shelf according to the size of containers, leaving a gap of about 10 cm above the containers to allow cold air circulation. Arrange small containers or aluminium foil bags in boxes or trays to keep them together and save space on the shelves. Use a coding system based on the location for sample entry and retrieval. Duplicate seed genebanks in more than one location as a safety backup. Accessions available at other genebanks may require fewer duplicates than unique samples. Select a site for safety duplication to minimize possible risks and provide the best possible storage facilities. A third safety backup can be kept in the Svalbard Global Seed Vault for added security. For more information about safety duplication see the safety duplication page. Cromarty AS, Ellis RH, Roberts EH. 1982. Handbooks for Genebanks No. 1: The Design of Seed Storage Facilities for Genetic Conservation. IPGRI, Rome, Italy. Available in English. 100p. Ellis RH. 1998. Longevity of seeds stored hermitically at low moisture contents. Seed Science Research 8 (Suppl. 1): 9-10. Hong TD, Ellis RH. 1996. A protocol to determine seed storage behaviour. IPGRI Technical bulletin No.1. IPGRI, Rome.Hong TD, Linington SH, Ellis RH. 1996. Seed storage behaviour: A compendium. Handbooks for Genebanks No. 4. IPGRI, Rome. Smith RD, Dickie JB, Linington SH, Pritchard HW, Probert JR. (eds.). 2003. 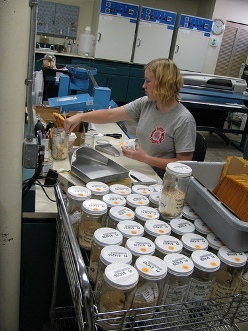 Seed conservation: Turning science into practice. Royal Botanic Gardens, Kew.